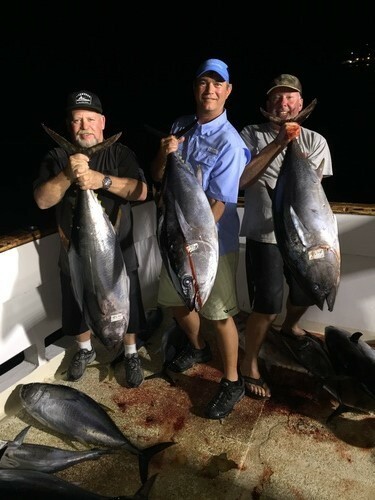 We returned from another trip of great fishing for Bluefin and Yellowfin Tuna. We had 45 mixed fish about a 60/40 mix with more bluefin than yellowfin. Most of the fish are around 50 pounds, some bigger and some smaller. The biggest this trip was a Bluefin around 80 pounds. We also had several Yellowfin around 60 pounds. We go again tonight on a 1.5 day open party trip that is a definite go with only seven people booked so far, please call 619-223-1627 for booking. Grande Sportfishing ©2015. All Rights Reserved.